Summer is slowly giving way to Fall, and we have lots to look forward to! Wednesday, September 11th at 6:30 pm, there will be a free screening of "Forks Over Knives" at La Mariposa Resort and Health Club on Houghton. This is to kick off their 6-week Vegan Challenge! We will meet Wednesdays at 6:30 pm - 8 pm, starting September 18th, and for the following 6 Wednesdays, ending October 30th. Each meeting will have a delicious, whole food, plant-based dinner. We will have gourmet vegan pizza with roasted veggies for the first dinner. Participation in this challenge is FREE to members of La Mariposa, and only $25 for non-members! There will be a fee for each dinner, still TBD - but probably $15. And La Mariposa will be giving prizes to those who complete the challenge! I am very excited because this is going to be a lot of fun. I will be teaching and demonstrating some recipes a couple of the weeks, but it turns out that La Mariposa has a number of long-time vegans on staff and as members, and they will also share their stories and offer support. So, if you (bring a friend or loved one!) would like to participate, please contact La Mariposa at 520-749-1099. Saturday, September 21st at the Fox Theatre will be "Your Planet, Your Health" sponsored by Healthy You Network, from 9 am to 5 pm. As usual, HYN brings a stellar roster of nationally-known speakers right here to Tucson! How can you beat that? 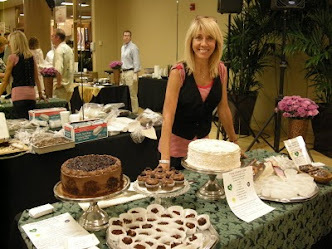 Well, Greenheart Bakery will be there, too, with a table laden with healthy treats - that's how! The lobby will be filled with vendors to choose from; all the best has been gathered for YOU. Please go to www.healthyyounetwork.org for more information, and to register. It's only $35, and that includes lunch from Urban Fresh - so what're you waiting for? for the complete description. We will serve an elegant vegan buffet lunch as well. This is a small intimate event. In the meantime, we are in the Friday UMC Farmers Market from 10 am - 2 pm. We also bring lunch items: today, in addition to our potato salad filled with veggies and herbs from our garden, we had sprouted organic millet lentil loaf sandwiches - yum! We joined the Saturday Loft Farmers Market this past Saturday. What a nice market! We shall be there every Saturday 8 am - noon. Come see us on Speedway! We will let you know when we schedule the next Greenheart Dining Club dinner. Aren't we fortunate to have so many choices and so much going on here in Tucson? Take advantage of it! Do share the lunch items. I'm so envious of everyone who lives in Tucson!